Glomus tumor arises from the Glomus body - a distinctive form of arteriovenous anastomosis that is involved in heat regulation. The tumor is most frequently found as a red-blue nodule in deep dermis or subcutaneous tissues of upper and lower extremities. The most common location is subungual region of the finger. 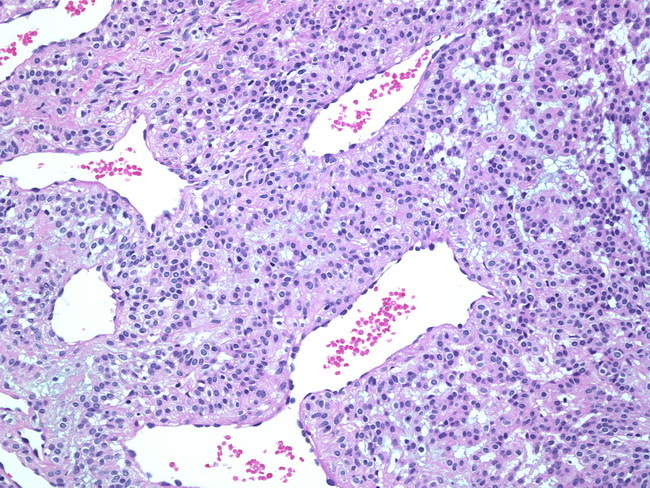 The image shows vessels of varying sizes surrounded by clusters of glomus cells in a myxoid stroma.